I've just begun listening to an album by an Oakland, CA group called "Charming Hostess." Gideon Aronoff also wrote about them in his Forverts article last month. Although they mostly sing/play music that is somewhere between punk rock and Bulgarian village music, they do reworkings of "Sha Shtil*" and "Di Grine Kuzine" that blow my mind. The major transform is that short hop to Bulgarish, but the harmonies and the tight playing are absolutely wonderful. Their version of "Sha Shtil" really captures the quiet of the song. This album is very amazing. Sometimes the textures could be richer, because alot of times its just violin and vocals up towards the higher register, and then the rhythm section. They use an accordion live though.... The members are involved in lots of different musical projects, one of them including clarinetist Ben Goldberg's (New Klezmer Trio) jewish/free jazz cd on the Avant label, "called 12 Minor"
Because I liked them so much, I always put off reviewing their album until I could do a really thoughtful, thorough review. Then, in the rush of too much happening all the time, which is the usual state of things here, I loaned the album to a friend, and forgot to do the review. This was discovered last week when I noticed that the band is appearing in Philly's Sixth Annual Intergalactic Jewish Festival, so I went to link to the review and discovered, with a face redder than usual, that there was no record on the KlezmerShack to note how incredible, how outstanding, how vital, fresh, and exciting this band is. 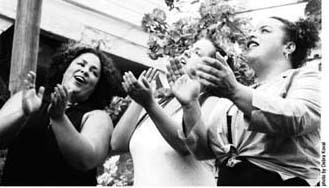 Roughly, the band consists of women who do (among other harmonies) those amazing half-step-off Bulgarian Village Choir harmonies, backed by a delightful, solidly disharmonic rhythm section. Damn this stuff is good. This is the type of music that Tzadik would be publishing if they weren't busy tending towards Jewish Windham Hill background music. But better, fresher, and still more accessible. The album opens with a rocking version of a Bulgarian village folk song and continues with vivid personal imagery in "Laws of Physics." As the album proceeds, the band mixes in their own songs, sometimes even a capella, as on "Mi Dimandas", a Sephardic song transformed by the Bulgarian harmonies. Or, they mess with your sense of what is: "Sha Shtil" isn't "Sssh, the rebbe is about to sing," instead, it's a setting of a yiddish proverb set to bulgarian harmonies, capturing the quiet of the moment in a deeper way than the more familiar song ever did. And then, on "Ferret Said" the band moves into hard-edged territory, musically and lyrically. And I think that is part of what makes this album so vital. It is a very focused, very hard-edged exploration of life and love and the human condition, grounded more than most in tradtional music, but also, inesculpably and joyously part of our own grungy age. True folk music for our time. True stories of life and people working out the boundaries of our time, especially working out women's issues of our time, from physical self-image to being beaten by a drunken spouse, or dealing with monogamy (or lack thereof). It's all performed exquisitely well. These harmonies are perfect. The instrumental backing is perfect. The melding is invidious: A bulgarian folk song acquires a klezmer melody; a traditional gospel song is recorded at Oakland, California's "Temple Sinai". It's three years later and it still rings true, and it's still on the edge. And I'm not loaning out this album any more. Unfortunately, because the album came out a few years ago, and it's not mainstream, supplies are limited. Buy yours today, or too darn bad. They may be out of print any day.